Click here to share our pride and learn why we won "Project of the Year" awards in Oregon and Washington. Our relationships span decades, so do our buildings. We build it right so you won't have to repair it later. Tigard City Hall was the Northwest Wall & Ceiling Bureau Restoration Project of the Year! When the San Diego PD called, we were proud to save the day. Leaders in air barriers and continuous installation, we eat energy codes for breakfast. Our EIFS repair for Black Hills High School restored the exterior. And historically significant projects deliver rare craftsmenship and thoughtful preservation. We're built to last just like your project. This Residence Inn was the NWCB Exterior-Commercial Project of the Year! Exterior repair sounds easy until your building has water damage. And our beautiful EIFS installations are built to last. We’re thrilled to receive our latest accommodation. Click through to see us on the cover of Walls & Ceilings Magazine. Check it out! Applied Restoration Inc., is licensed to serve the Western States and Alaska. so you won't have to repair it later. 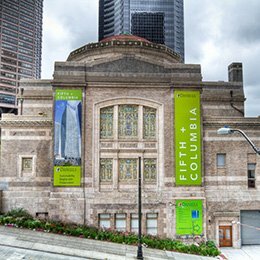 First United Methodist Church, Seattle When you’re working 60 feet up in air, in the dome and the vestibule of a historically significant property like Seattle’s renowned First United Methodist Church on Fifth and Columbia, you better know your craft. 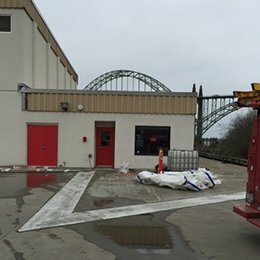 US Coast Guard Station Yaquina Bay, Newport, Oregon Completing an exterior EIFS overcladd restoration sounds pretty straightforward. But for US Coast Guard Station Yaquina Bay, in Newport, Oregon, we needed tarps, tenting and experienced pros willing to work in rain, wind and storms. We completed the project and kept the crew safe, with continual building access available 24 hours a day, seven days a week. A beautiful and water-tight building exterior, complete with new red doors, was our final outcome. Thank you to all the hard working crew members at US Coast Guard Station Yaquina Bay, we couldn’t be prouder to support the team and their focus on search and rescue and law enforcement. North Hollow in Portland, Oregon When you're in Portland stop by 15th and Taylor to see North Hollow, this beautiful building by SERA Architects blends right in with a quiet nod to the historic neighborhood. Public and private spaces are taking shape on our watch with multiple stucco textures and metal balcony accents. 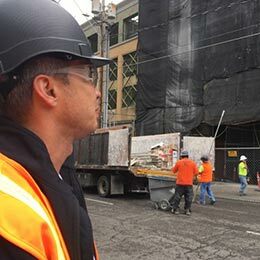 Here’s our own Keith Simchuk in action, keeping the crew safe and the stucco application worthy of our exacting standards.